Just a short post today. It has been a very trying time for the past two months but now things are evening out and it is time to get back into the thick of things. My DH underwent heart transplant surgery on September 19 and is well on the way to great health. This is his second transplant as he started rejecting the first heart after 10 years and it came as a surprise. We honestly did not think he would get a second transplant so when we got the call, we were shocked. This is a great blessing and we can't say enough thanks to the family who lost a loved one but even in their grief made life possible for several others who would not have survived without transplants. Life is the greatest gift they could have given. Now my husband will be able to see his grandchildren grow up and will possibly even have the chance to see his great-grandchildren. I will be getting back into my scrapbooking as soon as possible and will be starting a few clubs. I am just putting the finishing touches on the details and will posting when finished. So please stay tuned! I had planned on working on this blog in earnest from now on, making at least one entry a week with some artwork or a technique. Since my husband ended up in hospital on Sunday for a long awaited heart transplant, I have not done a thing. Well, I did make one card last night but I don't a picture of it yet. This weekend, I plan on spending time on this and get it all up to date. I have so many things planned - start a card club and a layout club, have a Croptoberfest Event are a few - and now I am rethinking my plans. Dwayne will be in the hospital until about the end of October, but once he is home, I will not be able to have any gatherings or workshops for a while. 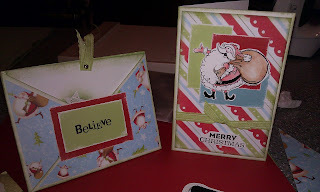 Convention may be 11 months away, but I have started creating cards to swap. This year, I only had a couple of months and ended up with only 15 cards because I had hardly any paper to work with and little time. 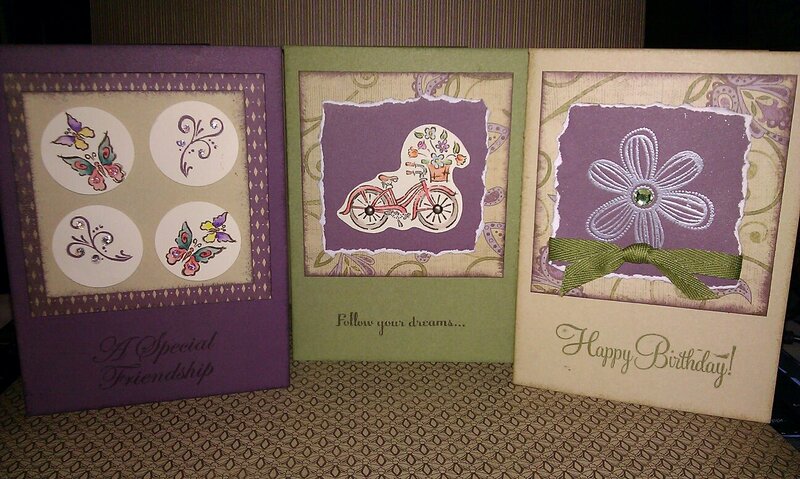 This time, I have oodles of paper and embellishments, and I am making time every evening to create a card or two. I always start by sketching an idea and noting the paper, ink and embellishments I want to use. Then I decide on sizes and note those as well. My cards don't always end up the way I draw them, but that is okay. Ink edges of cardstock and B&T. Adhere one 3 1/2" B&T to card front leaving room at the bottom of the card for the sentiment. Adhere 3" cardstock square on top of B&T. (Add any ribbon before adhereing.) 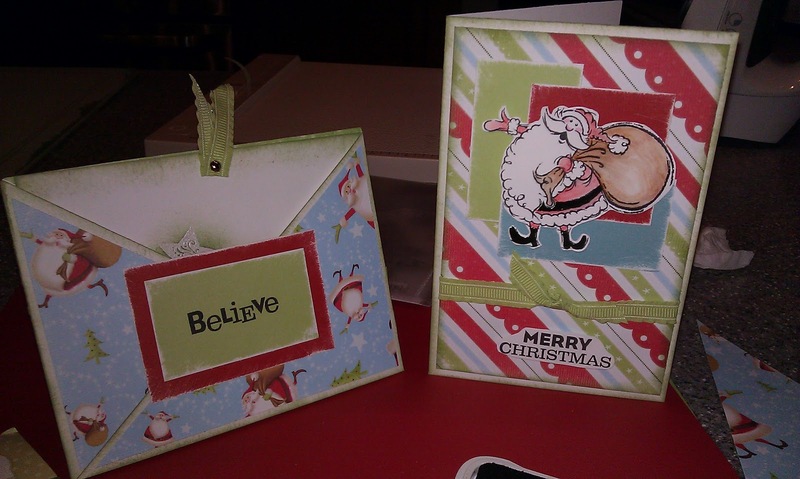 Add images, embellishments, and sentiments as desired. Liquid Glass - The Best Thing Since Sliced Bread! Ø I have used Liquid glass with Prisma glitter to make icicles before, but now I need another idea for this product. If anyone has any ideas for how to use this product that I can show at a crop tomorrow I would love to know it. If you have any ideas using another product that is a good sell I would love to hear it as well. Thank you so much for any help you can give me. Ø We used liquid glass on some B&T paper that had polka dots. We put on dot of LG on each polka dot which made the polka dots shiny. Also, I saw that some of the ladies used it on the ends of ribbon to prevent fraying. Haven't tried that yet but I will soon. Also, may try using it on a stamped image to make it shine. I saw that some ladies use it around the house like a mega super glue. Ø Don’t want a knot/bow in a piece of ribbon or fiber to keep slipping out? Add a dot of liquid glass on the back – it dries clear, rarely (if ever) discolors, and holds like crazy! Ø Use on shrink plastic to give a beautiful glossy look! Ø Here's my recent fave: pound down a bottlecap, cut a photo down to size and put it inside the bottlecap, then cover with the glaze and let it harden. Love the look! Need to watch it though - sometimes the pic wants to 'float', you may want to temporarily adhere it with something else before you glaze over it. Hey, I bet this could be pretty neat with our new bottle cap set! Ø Use it to add glitter to a project. Ø Use them on My Stickease ... I covered one of the blue star circles from Independence; took a bit to dry, but they are beautiful! Now I can't use just the plain stickease! I will go through a ton of this stuff! Ø It can and does change the ink color a little bit when you put the liquid glass on top. Sometimes it's a really good thing. It made a fish that Gail used look more vibrant and colorful.... Sometimes it can be a bad thing especially on words. Reds tend to be more temperamental. Ø When you want to put liquid glass on a shape... like an oval or square saying from the word puzzles. Stamp your image on your cardstock, but do not cut around it yet... Cover with a thin coat of liquid glass. Then add additional coats until it reaches the desired thickness. After your image is completely dry... then cut it out. If you cut it our first, the moisture from the product will curl the edges of your paper as it dries. Ø You can tint your liquid glass by mixing in a little re-inker. Then use a toothpick to apply to desired area. Ø It's fun to trace words with! Ø Works great on Stickease!!! Ø And our super duper trick!!!! Place small amounts on a sheet protector. When it's dry it peels right up and you can then add it to your project by placing a small amount of liquid glass around the edges to adhere it to your project. If you want to draw certain shapes, stick a piece of cardstock with the shapes on it in your sheet protector and then you can draw on top of them... Too fun!!! Ø Building on number 7 again... You can take a piece that is almost dry.. and crack it like cracked glass!!! Ø Layer it on your projects to give a smooth glass-like finish. Ø Spot Gloss: Apply a thick layer of liquid glass directly to the stamped image with the applicator tip. Let dry completely (about 30 - 60 minutes) before handling. Ø All-Over Gloss: Use a paintbrush to apply a thin, even coat of liquid glass to the entire image. Let dry (about 3-5 minutes). Ø Use the applicator tip to apply a thicker layer of LG to "select elements" of your design to add emphasis. Apply a second or third coat if your first layer was not standing up off your paper enough to please you. Some ideas are to apply it to leaves, flower petals, insects, teacup, umbrella, window, eyeglasses, Christmas ornaments. Ø Simulate dew on a petal by adding little droplets to flowers. You can also add it to the petals of actual dried flowers or fake plastic ones. This really does look like dew and you won't spend a fortune buying designers ones from stores. Ø Use LG to outline your image. This provides the look of embossing without needing the heat gun. This looks especially inviting when used as "frosting" of a cake. Ø Try applying the LG in layers. By that I mean apply a thick line of LG to the outline of your stamped image. Allow that to dry and then come back with a brush and apply a thinner coat of LG to the inside area that you outlined. Allowing time to dry between applications will keep the areas from merging and will add depth and make the image look 3-D. You can also add a 3rd and 4th layer by applying a second coating to an area that has already dried. It will really make your images POP! Ø Experiment with different applicators to add textured patterns to your stamp art. Use a paintbrush to apply a thin coat and swirl the bristles to create small circles, half moons, or squiggles to achieve different results. Use a stencil brush to dab on LG for a rougher texture. Use a sponge to create a spackled look. Ø Use LG to seal your shrink art pins. This creates dimension and provides a more exclusive look to your shrink art. This is the perfect way to seal your poly shrink wine charms while providing a great glassy finish. Ø After applying LG to an image, sprinkle a little Prisma glitter on top. This adds more dimensional sparkle than using other types of glue and looks great as candle flames, camp fires, etc. Ø Create a dimensional paint. Add LG to small containers you can find in the paint section of hobby stores and then add a drop or two of CTMH re-inker and stir using a toothpick. Then apply color as desired to your stamped image allowing a few minutes drying time between colors so they won't blend. This provides truly beautiful results. Ø LG makes the perfect glue for any project!! Use it to attach your poly shrink plastic embellishments, beads, feathers, and bows. It is very strong, great for adding hard to hold magnets, pin backs, and wire to your stamped projects. Be sure to let it dry completely before handling. Ø Use it to make flat marble magnets or bulletin board tacks. Purchase the glass marbles/pebbles that have a flat side to them in the floral section of craft stores. Then use the circle punch to create the perfect shape to place behind these see-through marbles. Stamp desired image on the card stock circle and color it in using the Markers. Use Krylon Matte Acrylic or use the Krylon Workable Fixative to seal markers. Next, apply Crystal Effects to the flat marble and not to the stamped image. Then press the marble onto the stamped circle. If you don't have the Krylon to seal the markers, applying the LG in this manner (to the marble instead of the stamped image) will keep the image colors from smearing. Apply a bit more LG and then attach a magnet or push pin to it. Ø Here's a twist on using it to make the flat, clear marble magnets . . .Trim small school photo to fit the back of the stone. Poor LG directly onto the picture. Then adhere to the back of the stone. Let dry and then add magnet to the back for a refrigerator magnet of your little darlings. Ø Use it to glue vellum to card stock. It won’t show through. I’ve found the best way to keep vellum from wrinkling or “popping up” after application of CE is to apply it with a fingertip or Q-tip applicator in a very thin coat . . . DO NOT apply it straight from the bottle. Ø Make Glitter Gloss using LG, prisma or other ultra fine Glitter, and an old paint brush. This is really simple. Squirt out some LG onto a scrap of acetate or other non-porous surface. Using a toothpick, stir in some glitter until you have the consistency you want. Then using a paintbrush, brush the glitter gloss onto your stamped art, stamped tiles, polymer beads, etc. When dry, it gives a glossy and sparkly look to your art. Try using this to add glitter to snowcaps made with liquid applique, add highlights to ornaments, Valentine hearts, etc. Anywhere that you want to add a bit of sparkles. You can also use this same homemade glitter gloss on hand painted ceramics and clothing. Ø Make a Stained Glass Glitter Window. Stamp image on window sheets using Staz On. Allow a second or two to let it dry. Next, use the tip of the LG bottle to move it (LG) around to cover each individual area with a thin layer of the LG. While it is still wet, dump on glitter. Only do one color of glitter at a time. let each area dry at least an hour before going to the next color. Ø Use it for "fray check" on the ends of your ribbon after you have cut them to the desired length. Ø Place on top of Radiant Pearls or Pearl Ex and get even more pearlescent shimmer and shine. Ø Use LG, stamped tissue paper and prisma glitter to create beautiful, sparkling ornaments for Christmas or any special occasion. Ø Create "Shimmering Pearls" by adding a small amount of Pearl Ex powder to some LG. Then apply over your stamp art with a brush. Ø Add LG to areas of images that you've dry embossed and achieve even more "pop"! Ø Use LG to seal beaded pens. After you make your pen, set it into a block of Styrofoam. Let your pen cure (inserted into the Styrofoam) for 24 hours. Then dip the pen upside down into the bottle of LG. Tip it right side up, and insert back into the Styrofoam to dry for another 24 hours. It works like a charm sealing the pen so that he beads won't fall off. Ø Put some liquid glass on a sheet of acetate--or other non poreus tray, take a baggie smooched up in your hand, dip the baggie in the liquid glass and smooche it randomly on a piece of card stock. Like the sponging technique with paint that was really popular in the 90's! Let it dry. Then sponge on ink--you can use more than one colour. I did this technique on bamboo cardstock and sponged on olive and chocolate ink. Wherever the liquid glass was resisted the ink and the bamboo colour showed through--I did this to make my own camo cardstcock. I've also done it on chocolate cardstock and lightly sponged cocoa ink, with the tone on tone it gave it a faux leather look! Ø I just tried making my own buttons with cardstock and liquid glass from the tutorial on splitcoast stampers. I cut out 5 circles/ size you want but I used 3/4 inch circles on cricut and then 1 circle ring of the same size with the cricut. You use any cs you want the buttons to be- which is totally perfect if you don't have that perfect color of button...anyways you glue each one on top of each other- with the ring last. this makes the button look real. using a tiny hole punch or piercing tool make as many "button holes " as you wish. Sand edges to blend ,hides all the layers and then over it with liquid glass- even the edges to give it the "plastic look"- lay out to dry on a piece of wax paper. What's cool too is it let's you make buttons of any shapes you wish- such as hearts, stars etc. I love the idea that if you don't own the button in the color of your layout...then make it! Was quick and fun to do- I used scrap Col white CS and distressed in choc ink before using the Liquid Glass to coat overtop- loved the antique look this gave them. If you want to see the tutorial go to splitcoaststampers.com under resources at the top right of the main page. Hope this helps even if a little late...smiling! Ø I had photos from a water park and used LG to create some 3-D water effects. I also used it to circle the grandkid in the photo to separate her from all the other kiddies. So play around and try out some of these! Have fun! Puddle Pads: NOT for Training Puppies! When I first saw the CTMH video for puddle pads, I was intrigued and decided I just HAD to try it! Wait! Full stop! I didn't own any re-inkers. No probem. Just order some! So that is what I did! So, now that I have several colors that all happen to go together, I will try to make a puddle pad and then make a card. To see the video for yourself, just go to http://www.youtube.com/watch?v=KHlWmEpP88M. Christine from Close to my Heart shows how to use them and has some great ideas. So I will be trying this technique and will post pictures of my reeults. Stay tuned! There are 46 days to Convention 2011 in Anaheim and I am so excited!! My first convention ever, for anything! Oh sure, I have been to weekend crop retreats, but they are so not like this. There will be hundreds of people from all over Canada and the US getting together to swap information as well as to learn new creative techniques and business ideas. I love learning so this will be a great experience for me. And I love passing on what I learn to others, so I hope to come back with a mountain of helpful information to pass on to my downline. This card was made using CTMH paper from Lucky and Olivia. 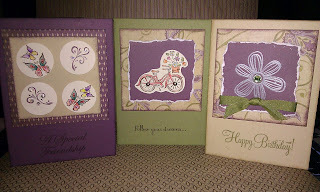 The cardstock is White Daisy for the base and Dessert Sand for the top embellishment. The Kraft border was colored with Olive ink and although it turned out really dark, it looks okay. The sentiment was also stamped in Olive ink. The Chairs to You card uses paper from the You & Me kit, twill ribbon and the May Stamp of the Month. I added color to the chair with a cotton swab and Dessert Sand ink. This card uses Wings paper, Sweet Leaf ribbon, and the May Stamp of the Month stamps. I added a few Mocha sparkles as well. This is one of my favourites, maybe because is so simple. Mayberry paper and cardstock, pink bitty brads and the Mayberry stamp set. The top pear has been raised up using foam tape to give some dimension, and the Sweet Leaf ribbon just adds a little accent. I hope you enjoy my cards. If you would like to learn how to make cards like these and more, please go to my website and send me an email, or leave a comment here. I would love to here what you think. I decided to take this past week off from work in order to get my craft room finished downstairs. 7 days later, we have most of the panelling on the walls. Still two panels to cut and place, then the cabinets and counter top get put on, and my desk gets put together. Then the fun starts! I get to organize the space with all of my crafting materials - aka scrapbooking materials. I have been scrapbooking for close to 20 years and have accumulated quite a collection from Close To My Heart, Creative Memories, Stamping Up, and others, and it is all jumbled together. My goal is to separate it all so my CTMH materials are all together and ready for workshops. The good thing about having tried all the various tools and materials out there is that I have found I like Close To My Heart most of all. My favourite Close To My Heart tool are the MyAcrylix stamp sets. They truly are the best! Because the stamps themselves are not permanently attached to the blocks but rather on carrier sheets stored in flat folders, they take up way less room for storage. Also, the stamps and blocks are made of clear acrylic, so you see through them. If you need to use the 2-step stamping technique, you can! Ink the first image and stamp it, then ink the second image and stamp right over top of the first. You can see through the block and stamp so you can line up what you stamping perfectly! And the selection of stamp sets is amazing! Close To My Heart makes sure there is a little something for everyone. Whether you are scrapbooking your sister's wedding, a special birthday (aren't they all special? ), the birth of a new baby, or just everyday life, there is a stamp set for your needs. I invite you to go to my website at http://worksofheart.myctmh.com and checkout the current Idea Book under Products. I know you will love not only the stamps, but all the products, as much as I do! If you would like me to come to your home so you can test drive the Close To My Heart products, send me an email to worksofheart@myctmh.com. We can set up a Home Gathering where you and your guests will test drive various tools to make a small project. And don't foget - you will be eligible for free product and discounts when the sales for the event get to $165! And who doesn't like free?? So let's talk about setting up your Home Gathering. Email me today! Welcome to my Works of Heart blog! This is my first blog here but it won't be the last! I will use this site to display scrapbook layouts and cards, explain techniques used, and just chat. There is also a link to my CTMH website where you can order Close To My Heart paper, stamps, and accessories online. When you are on my site, look for the link to Studio J. This fantastic software allows you to create beautiful layouts online and then order the pages. They are printed and sent to you so that you can add embellishments and then store them in your album! I love the Close To My Heart My Accrylix stamps! Because they are clear, it is so easy to see where you are placing the stamp on the paper. Have a look at the current Idea Book to see the latest stamps! That's it for now. I am keeping this one short and sweet. Until next time, remember that life is just a photo waiting to be taken and a scrapbook waiting to be filled! Caller: Sorry to bother you, but I am looking for Jan Gray. Me: Well, I USED to be Jan Gray, but am now McCormick. 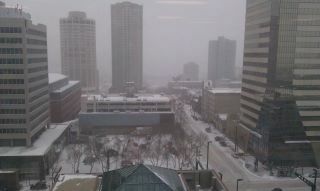 Caller: This is David Brown. Me: Oh my God. You mean New Zealand David Brown?? This is when the grin on my face got huge and I nearly fell off my chair. David and his wife Nina, and I had lost touch about 19 years ago as our paths went in different directions. I have often thought of them and wondered what they were up to. I searched Facebook, hoping one or both of them would be on this vast social network, but to no avail. And here I get a call out of the blue! I met David so many years ago when he was an instructor at the Northern Alberta Institute of Technology and my then husband was one of his students. Nina was also a student and once she graduated, they started dating and the rest is history. David was the best man at my ex's and my wedding, and we were friends for some time. The my ex and I moved to Vancouver and then to Halifax and we all lost touch. When I returned to Edmonton in 1987, I met up with David again and we met a few times for coffee. Then we lost touch again for 19 years.